And Audio Record It At The Same Time! SUPER SENSTIVE AMPLIFIED MIC WITH EASY TO WORK KEYS! 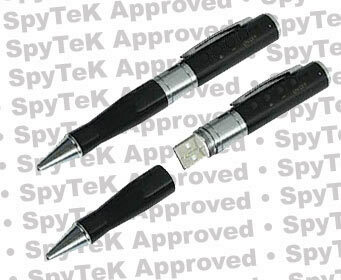 Working Executive Pen With Built-In Audio Recorder! PenTek TM - A New Generation Of Digital Audio Pen Recorder! The new generation black pen recorders offers you the highest quality yet in a working pen digital recorder! The sharp-looking black executive pen also functions as an extremely high high quality digital audio recorder in either 8 or 60 hour models with a super sensitive amplified mic. We have offered tiny audio pen recorders in the past and there is a lot of cheap ones on the market but there is NOTHING that compares to these new generation top quality recorders. These new generation pen recorders have a higher quality recording sound than the older generation professional grade pen recorders and are perfect for investigative, interviewing and law enforcement functions. The super sensitive built-in mic is of top quality that go along with the top quality of this fine writing instrument itself. The new generation digital pen recorders have three times more recording time than the older generation models. The audio recording results are broadcast type MP3 quality and produces crystal clear audio recording even when someone is speaking in a very whispered voice. Imagine being able to audio record a statement as you take it! Since the long play recorder is built right into your pen, you will always have a high quality digital recorder with you when you are on assignment. You can also use this excellent quality pen recorder as an MP3 player and a mini hard drive to copy and transport any type of digital data. It's great for recording interviews, meetings, taking notes on a surveillance or dictation. Fast download to your computer with build-in USB connection. • To secretly record conversations with persons whom you engage in conversation. • Very small, light-weight is suitable to reside in your shirt pocket. • The size of keys is moderate, so it is very easy for users with big fingers to use. NOTHING on the market compares to the high quality results you obtain from using this new generation digital pen recorder/MP3 player and fine writing instrument and we know you will love using it. This new generation gear is being offered at a special reduced introductory price for a limited time so be sure to get yours today! You will be extremely happy you did it! Not only will be you be glad you did, you are going to love this top quality gem! After using it for a week you are going to wonder how in the world you got along all this time without one! NOTICE: PenTek is a trademark claimed by SpyTek Wholesale .All rights to the use of trade names are exclusive and reserved. Theft of copyrighted material and trade names is a serious criminal and civil offense. Conversion of them for profit would consist of unauthorized placement and/or use in your promotional material including page titles and/or in your meta tags. If you wish to become an authorized dealer of our products, contact us.